Have you baked your cookies for Santa yet? Then you’re in luck because I’ve got a little something for you! 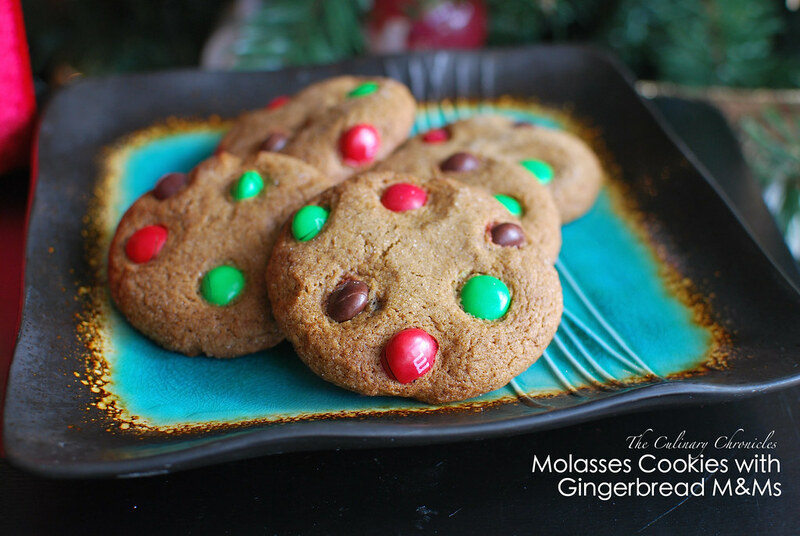 When this gingerbread lovin’ gal got my little hands on a few bags of Gingerbread M&Ms, I knew I had to pair them together with my favorite Molasses Cookies that I bake a ton of around this time of year. The original cookies are slightly chewy and have that wonderful spiced, warm flavor. 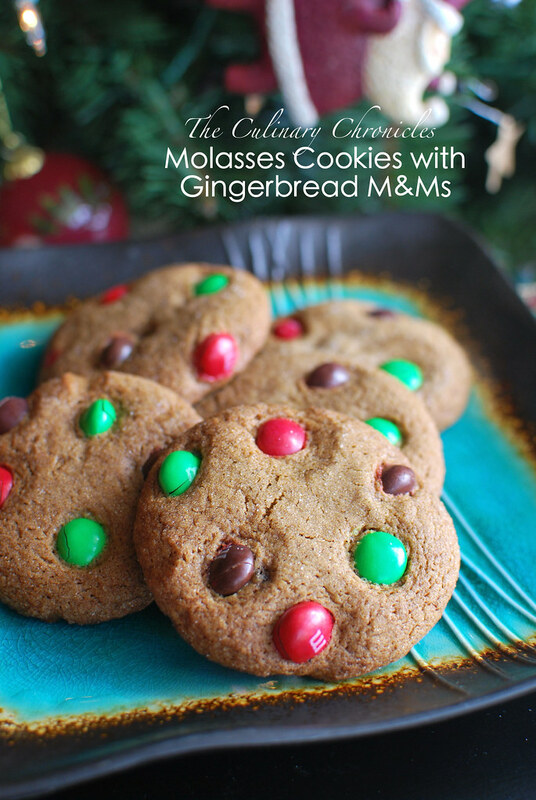 The addition of the M&Ms added great texture, and of course, extra gingerbread flavor–always a good thing. I’m pretty sure if you left these cookies out for the Big Guy, you’d score some major points. And with that, dear Friends, I wish you and your loved ones a very Happy Christmas! In a medium bowl, mix together the melted butter, light brown sugar, and egg until smooth. Stir in the molasses and vanilla extract. In another bowl, combine the flour, baking soda, salt, cinnamon, cloves, and ginger. Mix dry ingredients into the molasses mixture. Stir in 1 cup of the Gingerbread M&M candies. Cover and chill dough for 1 hour. Preheat oven to 375 degrees. Roll dough into walnut sized balls and roll them in the remaining 1 cup granulated sugar. Place cookies 2 inches apart onto parchment lined baking sheets. Using the bottom of a flat glass, gently press down on the cookies to lightly flatten. 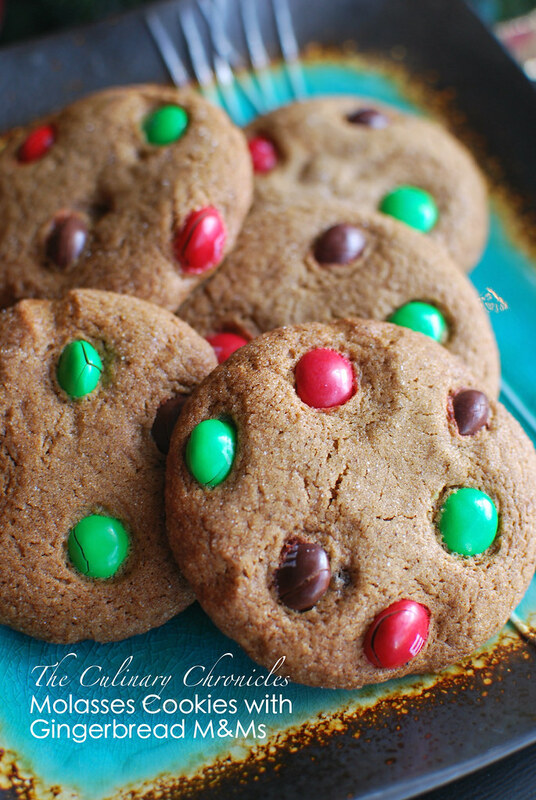 With the remaining Gingerbread M&Ms, add a few candies to the top/sides of each cookie dough, pressing them slightly in. Bake for 7-8 minutes until tops are cracked. Remove from baking sheets and allow the cookies to cool on the sheets for 5 minutes before transferring them to wire racks to cool completely. Store the cookies in an airtight container for up to 3 days.